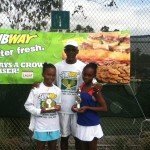 Though somewhat smaller than previous years, the Subway Jr. Tennis Tournament went off without a hitch this past weekend. 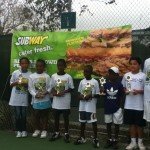 Thanks to the generosity of businessman, Mr. Shuffle Hepburn, owner of the Subway Restaurant franchise on Grand Bahama, young people from Grand Bahama and Nassau were given the opportunity to practice their tennis skills in the first BLTA sanctioned tournament of the 2012 year. Tournament director, Godfrey “Gully”Bowe was impressed with the number of new faces especially in the girls 10’s and 12’s. 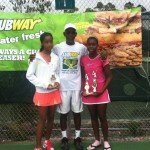 He stated that the future of junior tennis is beginning once again to look rather bright. Though a little windy on the second day of the tournament, there was no rain and a steady flow of good matches were played all weekend. In the under 10’s girls finals Emma Weech and Doneesha Gibson (FPO) played a tough three set match with Emma Weech (NAS) winning, 3-6, 6-1, 10-8. In the boys under 10’s finals Tynaj Hinsey (NAS) defeated Ivan Amira (FPO), 6-2 6-4. Jacobi Bain (NAS) and Kofi Bowe (FPO) met in the under 12’s boys final and in awe inspiring match with Jacobi Bain (NAS) defeating Kofi Bowe (FPO), 6-4, 5-7, 10-6. 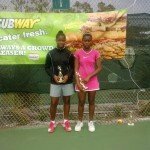 In the under 12’s girls finals Sydney Clarke (NAS) defeated Doneesha Gibson (FPO) in straight sets, 6-1, 6-2. In the girls 14’s Ieasha Shepherd (NAS) and Shay’Tonya Missick (FPO) played a grueling three set match with Ieasha Shepherd(NAS) defeating Shay’Tonya Missick (FPO), 6-7, 6-3, 6-1. Justin Thompson (FPO) defeated Kofi Bowe (FPO) in the boys 14’s, 6-2, 6-0. Justin Thompson (FPO) also won the boys 16’s defeating Harold Pierre (FPO) 6-0, 6-0. After experiencing severe cramping, Ieasha Shepherd conceded and Gabriella Bowe received a walk over to win the girls 16’s finals. 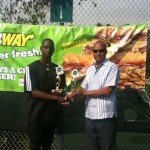 Godfrey ( Gully ) Bowe shared his appreciation to the sponsor, Mr. Shuffle Hepburn of Subway Restaurants as he congratulated all the players for their great sportsmanship shown throughout the tournament. Entry Deadline: Wednesday, 22nd February 2012 at 8 pm. Entry Fee: Singles $20. Doubles $10 per player. All players must play their age group in singles. Play no more than 3 events (including singles). Minimum of 4 entrants for a divisional draw. All players must be B.L.T.A. members. B.L.T.A. rules apply.